A simple app to turn your phone into a tool tracker. Use Apple or Android devices. Use what works best for your company. A $200 tool can bring work on a project to a halt if it can’t be found quickly enough. Don’t let that happen on your project. A good construction tool inventory app makes it quick and easy to find and transfer tools and small equipment. Stop calling around looking for tools. Search and find out who has the tool you need quickly by searching with your phone. Quickly move tools from idle jobs. Transfer tools directly from job to job while in the field. Make it easy for the office and the field to know who has each tool. Building a catalog of tools and equipment helps protect the significant investment contractors make in tools. Contractors often expense small tools as they are purchased and therefore lose track of how much they spend on tools each year. Over time the total value of a tool inventory can grow to represent a substantial investment by a company. In order to protect this investment you MUST organize it. If field people are constantly updating what they are responsible for then the office has a complete tool inventory automatically. With an updated tool inventory it is easy to list out the value of tools that are on any truck or at any job. Get automatic alerts when tools need calibration, service or testing. Alerts trigger on the phone of the warehouse admin & the field person. Reduce your annual small tool costs by increasing accountability for tools. A small increase in accountability will deliver a big decrease in the annual company spend on small tool purchases. Provide every employee with a list of the tools they are responsible for and they will lose fewer tools with our construction tool inventory app. After all, if the company doesn’t care about the tools why should the employee? Shift tool responsibility to the field. Turn every phone into a tool tracker so employees have a up to date list of what they are responsible for. A MOBILE app to track MOBILE tools. Tools are lost in the field so that is where your tracking needs to be focused. Know who had the tool when it vanished. Stop hunting for who had a tool when it went missing. 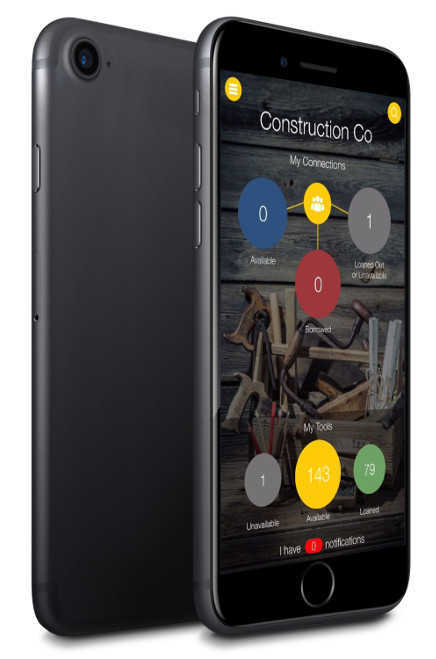 A construction tool inventory app built for companies like you. Hundreds of contractors are using our tool inventory app to track small tools and manage tools and equipment. It is easy to enter your tool inventory into our web interface. Then your mobile personnel can use the small tool inventory app on their phones to search the web tool inventory. Tools can be transferred from person to person in the field or from the tool crib. Tool tracking is as simple as using an app. With optional barcode tracking built in, small tool tracking has never been easier. Scan barcodes you already have or simply search by name and picture. No need for complex RFID, GPS beacons or complex asset management. Construction tool tracking needs to be easier than connecting 100 GPS beacons together. Small tool inventory tracking systems can be simple. Turn the phones you already have into a modern tool tracker system. Dig into our site to learn more about our modern construction tool inventory tracking system. Keep it simple as you start. You can start with just one step or do all 3. First, compile your tool list in the web portal so that you have a complete tool inventory. A single user can do this and assign all tools to “virtual” connections & locations. This operates like a simple single user check in/out system. Once you have an organized tool inventory list you can begin adding field users and assigning them tools. Field users can begin searching for tools and see a list of what is assigned to them. Add these users quickly or over time, it is your choice. The final 3rd step is to begin requiring field employees to “accept” the tools assigned to them. Once this is implemented field users can now use the app to search for tools and transfer tools from the warehouse or other employees. An in & out “acceptance” tap on the app keeps responsibility assigned and tracked. Additional functionality such as barcode tracking, maintenance alerts, calibration alerts and damage tracking is available in all stages. Take advantage of it when you are ready.